Offshore Wind is the first-ever roadmap to successful offshore wind installation. It provides a ready reference for wind project managers, teaching them how to deal with complications on-site, as well as for financers, who can utilize the text as an easy guide to asking the pivotal questions of petitioning wind project developers. These developers' planning stages will be improved by the book's expert advice on how to avoid wasting money by scoping out and mitigating potential problems up-front. Wind turbine manufacturers will benefit from insights into design optimization to support cheaper installation and hauling, thereby incurring lower project costs, and helping developers establish a quicker route to profitability. The book sheds light not just on how to solve a particular installation difficulty, but delves into why the problem may best be solved in that way. How Does the Author Feel about Wind Farms? 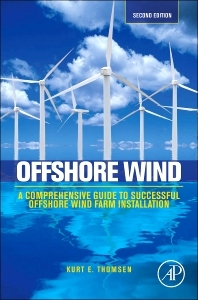 Chapter One: What Is an Offshore Wind Farm? Kurt E. Thomsen is the Founder and Managing Director of Advanced Offshore Solutions ApS. The company is focused on supplying consultancy services to the offshore wind farm industry exclusively, with the primary focus on transport and logistical solutions, design, build and operation of offshore windfarm installation vessels. Current clients include Credit Suisse, Eon, DONG Energy, MTHøjgaard, Statoil Hydro, Energie Baden Wurttemberg, Gamesa and many other major stakeholders in the offshore wind industry. The services provided by the company include development and implementation of methods, rules and guidelines for offshore wind farm work, setup and execution of the installation process for offshore projects, validation of equipment and auditing of same, contract negotiations and implementation of same to projects as well as development of new installation methods and vessels for the abovementioned companies in order to execute their project portfolio. Prior to establishing Advanced Offshore Solutions in 2006, Mr. Thomsen was Business Development Manager for the company A2SEA A/S, a company originally started by Kurt E. Thomsen himself in 2000. A2SEA A/S, is a privately held company specializing in delivering transport, logistical solutions as well as installation vessels for the offshore wind industry. The basis of the company is a patent for a semi jacking installation vessel, originally designed and patented by Kurt E. Thomsen. Before this, Mr. Thomsen was the owner and founder of Danish Crane consultants, a company specializing in solutions for the heavy lift industry on as well as offshore. He ran this company for 5 years before merging it into A2SEA A/S. Mr. Thomsen started his career in the shipyard of Frederica Denmark and worked for 15 years with docking and lifting assignments for the yard first as a crane operator since as a lifting supervisor. Mr. Thomsen received his Bsc. in architecture and construction from the Via University in Horsens Denmark in 1990. He has a leadership diploma from Århus Business Academy, Bachelors degree in Strategic Management, Lean Master. He is a qualified crane operator, assessor and crane specialist (According to Danish HSE rules it requires specialist knowledge to validate the use of cranes and lifting equipment, this requires diplomas in engineering, nondestructive testing and a minimum requirement of 10 years of relevant experience). Kurt E. Thomsen is based in Århus Denmark.